The DDEP is a 3+2 plan offering students the opportunity to earn two bachelor's degrees in 5 years from UNA and the University of Alabama. DDEP students may select a major in one of four disciplines at UNA and select a matching engineering program at UA (see table below). The program is designed so that academically qualified students attend UNA for 3 years and UA for 2 years to complete two Bachelor's degrees. The degree programs participating at UNA are Mathematics, Computer Science, Physics, and Chemistry. 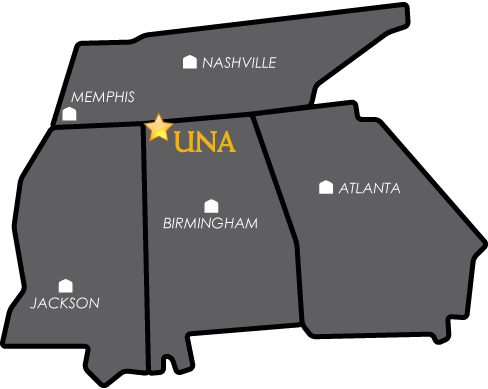 UNA also offers a Pre-Engineering Program (PREP) where students study for approximately two years at UNA and then transfer to another institution to complete a single degree. Engineering: Students who wish to prepare for a career in one of the many fields of engineering have two options at the University, a 3+2 dual degree program and a pre-engineering program. For advisors in specific areas, see the Department of Mathematics. Dual Degree Engineering Program (DDEP). The DDEP program is a 3+2 year curriculum plan offering students the opportunity to earn two bachelor's degrees in 5 years. One undergraduate degree will be in a participating major at UNA and the other degree will be awarded in engineering from a partner institution. Degree programs participating in the DDEP at UNA are Chemistry, Computer Science, Mathematics, and Physics. The specific curriculum for each DDEP student will depend on 4 factors. Each student will select a major program at UNA, a partner engineering school, and an engineering major to determine their program of study. Additionally, DDEP students may participate in the UNA Honors Program. Each DDEP student must meet the admission requirements for transfer students at the selected engineering institution. Pre-engineering Program (PREP). The Pre-engineering program allows students to complete one to two years of the coursework common to most engineering programs. Through the program outlined below* and advisement from a pre-engineering advisor each term, students will prepare for transfer to an appropriate engineering school.